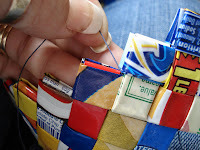 This blog page contains the instructions for you to make a wrapper purse using recycled materials such as candy wrappers, chip bags and even paper. 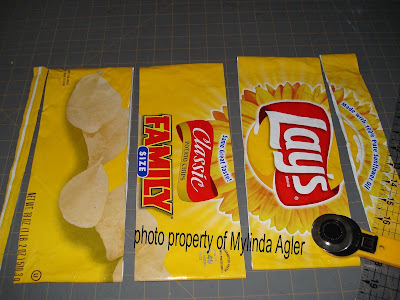 Cut each potato chip bag into 2 X 4 1/2 ” pieces. Using a rotary cutter makes it fast. I use potato chip bags, cookie packages, ramen noodle packages, anything really. I've tried some heavy plastics but they are hard to slide into each other, they want to stick. With the large potato chip bags it only takes about 20 bags to make a whole purse. (I think, don't quote me on that, that's what I tried to figure out one time. 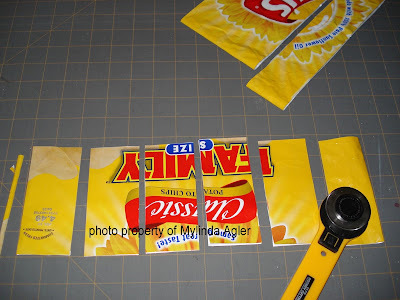 Cut magazine pages the same size as each chip bag piece. 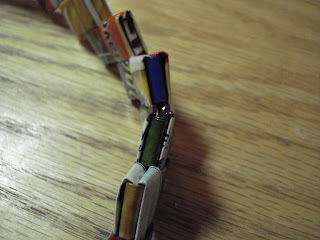 Each piece you fold will have a piece of magazine paper in it to make it very sturdy. You do not have to have paper in each piece when you fold, the difference is the thickness of the finished bag. I've made plenty without the paper inside and you can't tell the difference. Folding instructions for each piece can be found at www.gumwrapper.com/build.htm …….. start with #3 on the instruction sheet because your pieces are already cut to size. Once you have 60 wrapper pieces together you need to join them into a circle. Follow the pictures........it's like your making the chain backwards. I have to use a screw driver or something flat to push the piece down into the chain. 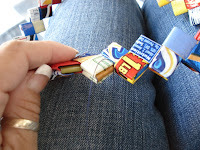 Tuck the raw edges into the previous wrapper so it looks like the other wrappers in the chain. Each wrapper pice has has like a positive and negative on each side if you are looking down on top of the row. You will be fitting a positive against a negative so when you sew the rows together you have a continues up/down sewing motion. You can use a large eyes needle with a blunt tipto sew the rows together or make yourself a needle out of a credit card or some type of heavy plastic. Poke a hole in one end for the needle to tie your thread on. Just a strong knot will be fine. The size of the piece of credit card was cut 2 3/8 X 1/2. That seemed to work the best but you will need a needle to attach the zipper. I’ve tried several different kind of thread……..I don’t know that there is a wrong or right thread……..as long as it is very strong. The thread that I was using in the photos was a denim jean thread. It’s very strong and won’t break but it was so thin that it actually was like a knife and cut my wrapper. DMC floss worked fine, I found a doily crochet thread that worked. I checked into the fishing line that everyone talks about, it was catfish nylon and would not break but I can’t find any thin enough. It’s all just to thick. I’ve read lots of info of speculation on how these purses are put together……………..they are all sewn and NOT woven or folded together. I also light to use baby crochet yarn. It's a great thickness and won't break when it's pulled tight. Put two chains together as I described with the positive and negative. You will be sewing down thru a chain, over slightly to the right and down thru the next chain, up thru the next chain and down thru the next one. Follow the pictures………You will continue to do this until you get all the way around to where you began sewing. Continue sewing in an up and down motion until you go all the way around. Make sure you pull the thread tight so you do not have any gaps or see the thread. 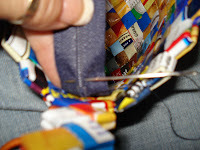 photo showing running the thread over the top row to sew the other side of the purse. Squeeze the bottom together and start sewing. You will only be able to sew the outside of this row. 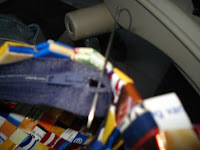 There is not enough room on the inside of the purse to sew like you did on the other rows. Continue sewing along the bottom. You will be tucking in one wrapper square at each corner. Once you get it tucked in, it's not going anywhere because it's so tightly wedged in to the corner. Doesn't matter what type of zipper you buy..... just so it is long enough to go across the purse. 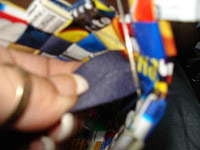 You will cut the excess off when you are finished sewing onto the purse if it is to long. Catch the very edge of the zipper and then run your needle down thru a chain and up the next one. If you look really close at this picture, the needle is running down thru the chain of red wrapper with the yellow strip through it. The needle will come back up through the white chain. This picture is a little blurry but what I'm trying to show is the needle coming back up the white chain. You will catch the edge of the zipper at every "v" around the chain. 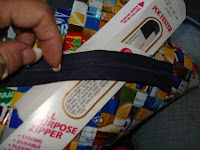 Do both ends of the zipper like the picture. It doesn't really matter how long the zipper is because once you tuck the ends inside the purse you can cut the zipper off. Still working on the instructions for the ..............you'll just have to look at the pictures for now. 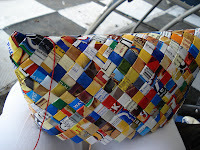 Thanks so very much for posting the tutorial on the potato chip wrapper purse. I have seen so many folks said they were going to post the instructions for these purses and never did, you are the first on the web (imagine!) to do so. The instructions are clear and easy to understand. I have been making these purses for about 8 months. I had to buy a purse and study it to learn how to make them. This is truly an art that has so much potential. There is so much to learn but this is a great beginning. 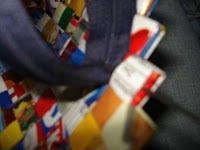 I noticed someone made a very beautiful purse using magazine covers. That should work fine but if you want to make a purse that is water resistant cover each piece of paper form the magazine with storage tape. I use the scotch brand storage tape it seems to work best(less static). The storage tape is almost wide enough to cover the pieces of paper you are using. Put the piece of paper on a flat surface try to put the tape right down the middle of the paper. Then cut the tape to the size of the length of the paper. When you fold up the paper it ( the outside) should be completely covered by the tape and very strong. I mention this because now that we have good instructions, folks should not have to wait until they get enough potato chip bags or candy wrappers to begin using the information. I look forward to more exciting developments on your blog. I also made my first purse out of magazine covers since I didn't have enough chip bags and that was my suggestions to nan. She is covering the outside of hers with puzzle glue and I'm using modge podge to see if we can make them durable. I'm not so much worried about the water as I am the papers tearing. I also thought about covering each piece with packing tape but thought it was to much work but if someone else is doing it then maybe I will too. I understand you instructions to say that you fold the packing tape to the inside. How does that make is waterproof? Are you using the regular pages of magazine or only the covers. I used only the covers to make my first purse since they were stronger than the inside pages. I'm so excited to hear that there is someone else that has made this purse. If you have any more ideas or suggestions I would love to know. Send me a picture and I'll put it up on my page. I've been experimenting with magazine covers and newspapers. I had too many problems connecting each piece when it measured 2 x 4 so I increased the size to 2 x 4-1/2...it was much easier and doesn't leave any spaces. I also put packing tape over each piece but don't want to continue with this method because it is very tedious. Additionally, it makes the purse very thick. 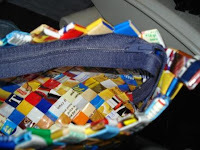 My idea is to make cosmetic bags out of newspapers for Christmas gifts...so I don't want the "material" to be so thick http://www.ecoist.com/newspaper.asp). I also recently saw them at a store the newspaper ones were very thick...I thought too bulky. I was just thinking of trying modge podge...please let me know how it works! Hello. The storage tape should wind up being on the outside of the folded piece of paper. This makes the piece of paper very strong and durable and highly water resistant. for this I would use the pages of the magazine not the cover. If there are pictures on the pages that you use, the tape will make them look like beautiful glossy photos. try to use pages that have mostly pictures on them. 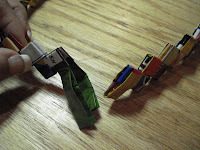 To see how strong the tape will make each segment cut a piece of storage tape 4 and a half inches long and fold it up(no paper added) as you would the paper segments. Now try to tear it. It will be very hard to do! Basically you are doing the same thing as you are doing with the candy wrappers. There is a plastic material on the outside of each segment and paper underneath. With the use of the clear tape the picture or pattern will be on the paper not on the plastic. As far as the purse being too thick with the tape being placed on the paper, you want your purse to feel strong and durable not flimsy. Tape is not much thicker than the material used in making potato chip bags. As far as this being time consuming, this kind of work just takes time! Mylinda, can't thank you enough for taking the time to do such a beautiful job of laying out the instructions. I've been looking for decent instructions for probably a year now, and I'm fairly certain yours is the only site with a complete and easy-to-follow set. Almost seems like it's some kind of trade secret! Great job and thanks again! I just came back from Mexico 2 days ago and bought a chain purse for my niece for about $5! They also had some more elaborated and bigger ones on the 100's at some boutiques! Don't know if I will make one, but it is nice to have this tutorial! Thanks! if you make it out of magazines does it need to be double sided? The instructions were great and easy to follow. I made my own little clutch purse following your instructions and chip bags turned inside out. I love it! I already have people asking me to make them purses. 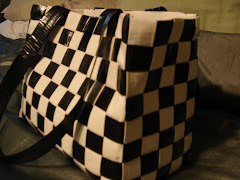 I posted a picture of the purse on my blog: Sugar Lotus. thanks for posting this i've been looking for something like this. but every time i mess with chip wrappers it slips and won't make a very strong chain. any advice? 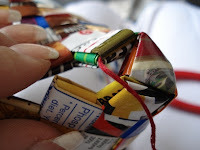 i wanted to ask you do you cut a lot of pieces and fold a lot of pieces storing them in an envelope (that was the suggestion out of family fun magazine) then link them all at one time? or do you cut a lot of pieces, fold one piece then link them together as you fold another piece. to me its easier to fold and link rather that store them and hope they dont unfold. but what do you think? and you said you add a piece of paper from a magizine inside each chip bag to give it strenghth but if i made one out of magazine covers only i wouldnt need to add the magazine pages would i? I have not yet made a purse with a flat bottom but I do have some wonderful pictures of one that was sent to me. My next goal is to make one and believe me......I will post instructions and pictures. 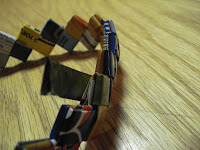 To answer another question......This is what I do.......I cut stacks of chip bags and magazine pages at the same time and have them rubber band together. That way I can keep a stack of each in my purse to fold when I'm setting someplace and bored. When I used the magazine cover pages I only needed one piece because it's so thick but on the chip wrappers I have to insert a piece of magazine page to make it thicker. There is a difference in thickness between magazine cover and pages. 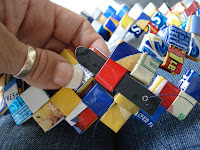 When I made the purse from magazine covers I folded lots at one time and kept them in a basket to connect into chains later but when I'm working with the chip wrappers I add them to the chain as I fold them because they don't stay folded as well. I have all my girls on my bowling team folding for me.......They all know I've lost it!!! My little homemade needle for sewing the purses together finally got brittle and broke so if anyone has any other suggestions on what to use I would love for you to share. can you use the stuff they make stencils out of for your next needle? its plastic, or do you think that would be too flemsy? thanks for the suggestions i have lots of mags right now that i was about to recycle at my daughters school so maybe i should start with that one. thanks thanks thanks. also i signed up to blog just becuase of this but is there anyway i can mark this from my profile so i can find it easily from there? The template plastic was my very first try and it didn't last long......so that's when I went to an old credit card because it was thicker......It did last for about 4 purses before it broke.......I just need to get more credit cards....lol. The way you can mark my page from your blog page to find it easier is to do like what I did with Nan's blog page. On your blog page...go to customize > template > page element > add a page element > link list > Type in title what it will say on your page and then copy and past my blog address into the URL. The only way I find my blog page is I have it bookmarked in my favorites on internet explorer. Hope that helps and I'd be happy to add you to my blog page once your up and running. I've been using a collar 'stay' from some old dress shirts of my husbands, they are already the right size, and cut to a tapered end, all you have to do is add the hole, so far so good! When I say a collar stay, I mean the plastic insert that is used to keep a dress shirt collars shape and stiff. dear mylinda, thanks for the help on my question about my strands not being very strong. actully my papers were the right size I had just forgoten the part about putting magazine paper in side it. I was suprised at the difference it made. Thanks again I had wanted to know how to make one and I have a lot of time on my hands so I working on one that is completely silver than it has a brightly colored zipper. hey mylinda i can't decide what kind of string to sew my purse together with, does anybody have many suggestion? i tried fishing string but it slipped to easily. You are correct about the fishing line being slick. My cousin just said that she used #8 cotton thread which is also what I use......I just don't know what size mine is.......It's the thread that is used to crochet doilies. Using 6 strands of any color DMC floss also works. The thread I use is a #69 Conso thread. The thread (#69 Conso) is black but it comes in many colors. I believe the thread is used also for upholstering furniture. I have a 8 ounce roll of it that I have been using for ten or more years. I usually cut a piece of thread 4 arm lengths long (It is a good idea to start with a shorter lenght until you get use to using thread) . If I am careful I can use that lenght without getting too many tangles that I have to tease apart. I tie the piece of thread on to the work so that I am working with only 1/2 thread at a time so the whole thread does not get over worked. I have a question related to your question. has anyone found a good way to keep the thread from tangling up? Most times I do not have a problem but when I get stressed it is like magic the thread seems to get tangled up! I have found that working with a large needle helps. It seems to open the the work up a bit and reduce the wear on the thread. I use size 13 to 16 blunt end tapestry needles. I have tried treating the thread by rubbing it with a dryer sheet to reduce static but that did not seem to help me. Here are a few thread detangling tricks.........Can't really say they are tried and true but you might want to give one a try. 1. Coat your thread with bees wax. 2. Iron your thread.....it takes the spiral out of the thread. 3. Thread your needle from the end of thread coming off the spool. Remember.....the end you cut is the end you knot. That's the only ones I can remember. hi, i'm using the normal needle to sew it is fine and we can use the string for the fishing rod as string also. My thread of choice to sew my bags is waxed dental floss. I know it's not what you were expecting to hear from me is it? The reason? It's flat, it's already waxed, it doesn't knot up as easily and it's strong. All I can say is give it a try and see what you think. Now for the fun, come to my blog page and see some other crafty crafters at work, I had a contest over the past 2 weeks and have posted all of the entries today, and want honest input and voters! Thanks! I think I'll try using dental floss, it ingenous! I never would have been able to come up with that thanks so much you are all so helpful and diligent on answering people questions thanks so much. 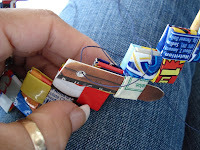 The very first thread that I used was dental floss but I couldn't tie the pieces together because it just kept slipping apart every time I pulled on it. I not sure how Nan tied hers together to continue sewing but I would strong discourage using dental floss. I tried using dental floss and it worked great. I did have some trouble tieing them together but once I started sewing again it didn't make a diffference. I'm not trying to contradict you though everybody has a different thoughts. thanks again for all the help every body has been, you answer every question with patience, thanks. I posted a tutorial of sorts on how to tie floss so it won't slip out, tie it this way and try it and see if you like the results. Mylinda you are absolutely the best! I am an art teacher and have made these purses auction items for our school's fundraiser. The kids have brought in lots of chip bags and are all interested in the results. Thanks so much. PS I found out that it is essential to put the handle to the purse almost like you connect the rounds so that it is invisible. here is my suggestion for the thread. why not use regular thread but use four strands instead of two. I handsew and always use four strands and it makes the stronger. That is AMAZING! I have made plenty of things out of starburst wrappers, but I never quite figured out how you could go from one chain to an actual shape. Thanks again for this wonderful tutorial! 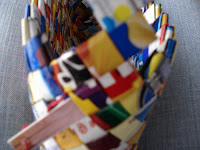 Hi, Mylinda- I made a purse using wallpaper and your instructions and just started a blog on fiber art. I mentioned your blog and included a couple of photos: http://fiberfocus.blogspot.com/ Many thanks for the excellent instructions! Thanks for the instructions!! I almost have my first purse done. I didn't quite get the hang of pushing in the corners and I think I need to sew it a little tighter. There is always next time! Your instructions are great!! I linked to your site on my blog. I hope that is ok! Thanks! 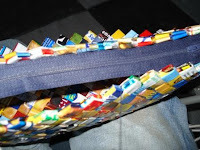 These are soo great..found another site with some different folding to try.. http://www.tramp-art.com/prison_art.htm also did an ebay search for "prison art" and there are some awesome pieces to attempt to make there..I am just stoked about this wrapper folding!!! 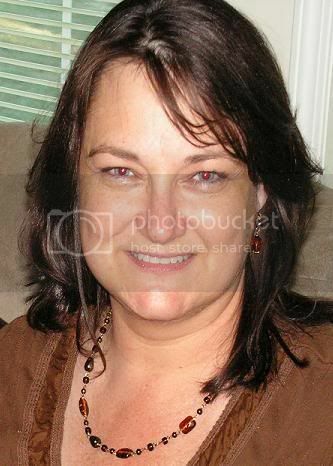 Mylinda, Congratulations on reaching more than 40,000 visits to your blog. Thanks again for making this very valuable information avaialble to the world! Hi Mylinda! Thanks so much for posting this - most helpful! 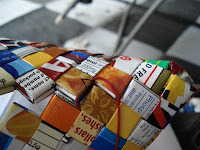 I've actually started a bit of a project in Bolivia using the same design, but with plastic milk and juice bags and have my blog done with Spanish instructions :) It's a great way to promote recycling! 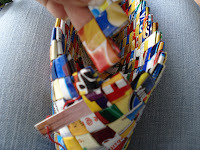 I am currently making a purse and have found a GREAT source of wrapper-like material. I went to the dollar store. They had a whole rack of banners saying things like Happy Birthday etc. It is the same material as a candy wrapper. I paid 1 dollar for a five inch by six foot banner. The one I choose was a soft yellow with the lettering in different colours and patterns. It's making up into a beautiful purse. I love this, ive been looking everywhere for the instructions thank you....I have a question. 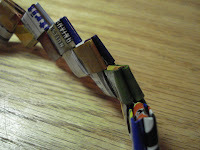 Im making a bag out of magazine cover and some of the links come out, how can I keep them in place, im I doing it right? I think this is incredible. I just love it. My husband used to do something like this when he was a teen, so he got excited and quick showed me how to fold a link while I was reading your blog. I'm so excited to be finding another way to recycle something instead of burning it (what everyone out here in the country does with their trash - yuk)! Very cool idea! This would have been great for me when I was eating a bag of Salt & Vinegar chips a day. But then again, I was only 3 years old at the time. ;) Love the purse! You did an amazing job! What creativity you demonstrated. thank you so much for sharing! This is definitely a "green" purse. Hi um just WOndering.. HOw long does it takes to make a purse like that ? Thank you so much for taking the time to do this. My search is finally over. I love the crafter community online. It just goes to show that sharing is important no matter how old you get. I made a flat bottom purse with camoflage (hunting magazines-cut out everything) covered in mailing tape (storage tape is too thick), sewn with dental floss & bamboo handles. These are very pretty. 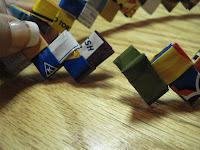 Pull the tape - sticky side up, place the paper on the tape, then cut them apart after all pieces are in place. Thank you for the ideas & help. Thank you so much for taking the time to do a tutorial on this. Many many thanks. Here is the answer to the last 2 posts. It is not necessary to cover each piece of chip wrapper with tape. The reason that you cover the magazine paper with tape is to really make it waterproof. Chip wrappers are already waterproof so there is no need to cover. You only use a single layer of chip wrapper. It does make the total stability of the purse thicker if you insert the piece of paper inside the chip wrapper piece before folding. It is not a must but end result to nicer. The bags on your page are so cute. I was just wondering how you were able to get the different styles that you display on your page? hai... this is a really great instruction, thank you for that. I'm answering the last couple comments: All sizes are in inches. 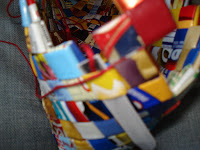 I get all my pictures for this blog from others that have made purses using my directions. They give me permission to use there pictures on my blog. 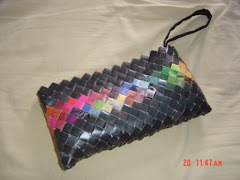 Hey, i dont speak nor write english very well, but i eant to know how do you made the purse that is black and withe, one of ou new proyects, the one that finish straight please please!!!! i wanna know becaese i want one but they are so expensive! Thank you for posting this. I like the instructions but have some questions. How do you make a flap (instead of zipper closing) for it? And how would you attach it and keep it closed? How do you make a flat bottom bag/messenger bag? Im working on a small bag. I had a few problems with the bottom. I torn part of it when trying to use the screwdriver on the corners. How do you do it without damaging it? And how do I tie off the bottom too? Thank you again. Im sorry I really dont know how to "blog" and am a newby to crafting but I have decided to give it a try. I am trying my hand at some of these purses. the bottom corners of the chip bag purse are tuff so far, cant seem to get them to push in and they ripped when i tried the screwdriver. but my real question is.did you ever get the tutorial for the pot top purse shown? if you were going to do one. that is the best looking one I have seen on the internet. you are very talented! again..sorry I am not to good at this. Once again, I'm going to try to answer several questions at once. 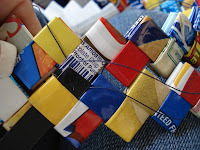 To cover the pieces with tape, go to candywrappercrafts.blogspot. There are instructions there. There was a questions on where to buy mod pog, go to any craft store or Walmart. 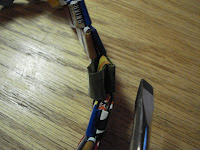 To get the corner pieces to bend in to the center, try fold that particular piece in half with a pair of pliers. All your really doing when you push that piece to the inside is folding it in half. See if that helps you. I have figured out how to make the purse square along the top but not time to get anything written up and posted. 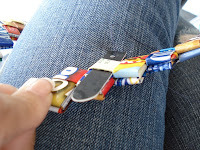 I will post a picture of the belt I made which is a rectangle. See if you can figure out how to make a purse by looking at the belt. 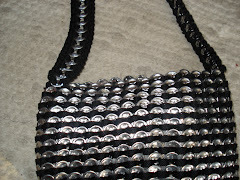 I have not posted the instructions yet to make the pop tab purse. I started a blog page with the picture but that's all the further I've gotten. I love the belt that you posted a pic of & I've pretty much figured out how to make it. The only question that I have is how to attach the buckle....do you fold the belt over the buckle & use rivets to hold it in place? Hello! I am thrilled to have found your website on these purses! So you say about 60 wrappers will make one "round" or circle? How many circles or rounds do you typically find you use for each purse? Just wondering... thanks Hope to hear back! Thanks so much for this post! 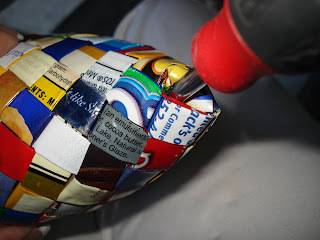 I am very new to this "candy wrapper" world,(Im actually still collecting information in order to start my very first handbag) its so great to have detailed advice so I can start my project right away! To Sara - My purse is 7 rounds with 1 additional round for the handle. I do have one that is 6 rounds and it's just as cute. I might suggest, to get you started, to make one of the little coin purses that you see. You use 28 pieces per row and only 4 rows. It's made exactly the same as the purse you can just get it done in couple of days verses a week! Hi Mylinda, I almost finised my 7 chains... I mixed cover magazines, inside pages and some candy wrappers. It looks nice but I don´t konw how it is going to look at de end. I will tell you. 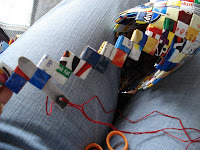 Now I´m looking for the thread. I´m thinking to use a blunt needle that I have. Parabens pelos seus trabalhos em reciclagem, apenas gostaria de saber se é em plastico ou papel. Just finished my first attempt at this project & wanted to share some of the things I tried.... 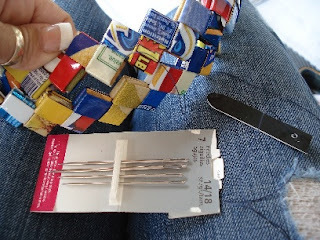 I used nylon jewelry beading monofilament to sew my wrappers together & this worked well for me. You can get this in different strengths/thicknesses. I didn't have an old credit card, so I used a large paper clip. Worked fine for me. Also used clear contact paper on large pieces I thought needed extra protection. Does any one know of any reason why this won't work? Finally, just wanted to let other beginners know that single size M&M wrappers will tear, so cover them with tape first! This was so much fun, I'm anxious to start another project. Thanks again Mylinda! thanks for the instructions for this. 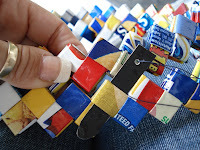 I was wondering if you can post instructions about how to make the wrapper belt? I see you posted on how to make the cap belt. hi, thank you for the instructions. I made a purse for my 20 year old daughter with magazine pages covered in tape, using mainly pink green and blue colors, (I found a People magazine on Hannah Montana that was great) I added tiny pictures printed out from my computer and taped them on some of the pieces to personalize it. It came out great! Thanks so much for this! I am looking for green projects to do with children. Hopefully since I'm a weaver I can learn this one. Im kind of trying to figure out how to seal the purse when im done so that water wont ruin it or it wont scratch easily...what glue should i use and how to apply it?? Love the purse.....when will the instructions for the handle be put up??? i tried to do it following the pictures...never was able to keep the handle on. PLEASE put adding on the handle instructions!!!! Thanks so much for showing how to do this. I bought a Nahui Olin wrapper purse for $100 and get complimented on it all the time. I figured if it's so popular, I would love to make them as gifts for people...now I can! Thanks for taking the time.... Ill do my own purse now! Thanks for posting the tutorial! I've finally finshed all my chains, but am having a really hard time sewing them together. I've tried (and failed) four times now. Each time the problem is the same...the chains aren't tightly bound. Even though I'm pulling the thread tight, they just seem to...gap apart when I'm two rows away. Any help would be greatly appreciated. I'm really not sure why your chains are gapping when you sew them together. Where are the gaps?? Make sure you sew on the inside and outside of each row. Also, make sure you are putting the rows together with a positive and negative together as described in the instructions. If anyone else has any suggestions or comments on what might help Mandy... please feel free give suggestions. I love these instructions! I made a purse for each of my girls. One is made entirely out of Cheetos wrappers, one is made from just about any kind of food wrapper we had available! You really start to pay attention to how stuff is packaged, and you start realizing how much stuff you've been sending to the landfill when you do one of these. 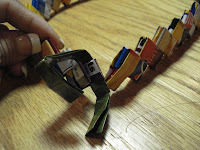 I join my rows together using "gimp," that flat plastic stuff kids use to make lanyards. It's strong, flat, flexible and I don't need to use a needle. I do have to use a needle and thread for the zipper, of course. I make mine 9 rows high and the handle 2 rows thick. I'm having trouble joining the handles on the ends in a way that isn't going to come apart. I think I'm missing a step there. Might make the handle out of something else the next time. I would love to donate one of these to a school or church fundraiser. I'm going to try to figure out how to do a basket instead of a purse. i finished sewing all the rows together, and they look great, but im having trouble sewing the bottom together. i can sew the very ends together and its not going along smoothly. Please help! Last fall, I discovered candywrapper purses while shopping in Burlington, Ontario. The sales person told me what the technique was called, and when I googled it I came upon your website. I starting making the purses last fall and have made 20 so far and showed 30 people to make them, all proceeds go to charity. I prepare kits and the students choose the charity where the proceeds go to. So far I have raised 1,200$. My son created a website for me and I was hoping that I could use your instructions or mention your link, I need to post them in French and English. I work as a secretary in a London, Ontario French high school, and have been teaching our students, and our community. I send purses to silent auctions for non-profit organizations (cancer society, foodbanks, local schools, youth and women services). Hoping to hear from you soon, thank you again for helping me create such fun fundraising opportunities! Yesterday I set up a table in a flea market to sell some of my candy wrapper purses. Many people came by and looked at the purses. One person that came by was an older gentleman. 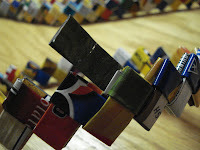 He said that he had made items out of cigarette wrappers when he was in elelmentary school. I asked him if he was just making the chains and he said no. He said they were taught this craft in school and that they made all kinds of things(baskets, purses,belts) The interesting thing was that the gentleman said that he was in his eighties! He said that they were learning this craft in the thirties! I was wondering if anyone knows how old this craft is and where if began. 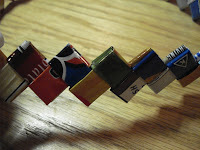 I am always amazed at how you can take small pieces of paper and make strong, durable items out of them. Thank you so much for your detailed example of how to do this. I have recently been diagnosed with breast cancer and am under going chemo treatments and needed a project I could do from my bed or while getting treatment and this is just perfect! I cant wait to see how my finished project turnes out. God Bless you! I loved the tutorial and know i have a bag of my own. I am now interested to do another one but i want to do the one where the lines are straight (like a long rectangle) instead of pointy, do you know , or does someone know, how to do those?? It would be very very helpfull if someone told me how to do it that way! This response is to the last comment on how to make the bags straight across the top instead of pointed. The bags that you see that look like the wrapper bags but are straight across the top are actually woved just like you would make a basket. I would assume to your research basket making and use the wrappers for your material. The other option would be to make the rows like I made the belt and sew those rows together. Hope that answers your question. WOW! I bought one of these and I wanted to make one, but didn't know how, thanks for posting a how to ! just got back from Mexico on vacation these were for sale everywhere. I paid about eight usd for a little bag 8 inches by 4 inches tall. That seems really cheap for all the work put into them, whats really nice is some of the wrappers you can read the word Mexico and other spainish words. Thank you very much. I followed your tutorial and was able to make a small purse..
Hi, I love the purse you've created. I was planning to do something very similar to it for my Year 11 DT project. Just few questions you could maybe help me with? 1. How long on a general estimate did it take you to create the whole bag? 2. If I want to make a similar bag but with a silver tone. Exactly like Joanne's and your cousin Debbie's. What material should I use? I've purchased car reflectors as a potential material. Do you reckon that could work? It's amazing what kind of ideas people have! It's so original, and also looks good! It's a pleasure to just look at it. I'm 15 years old and I was in desperate need of something to do one day. I finally came up at your site after endless googling, and it is pure genious! These purses are so cute! I tried out my first one and it looks a little sloppy, but its sooo durable for magazine paper. Actually, yesterday I was in the M&M store in NYC, and bags like this sell from around 50-over 100$!!!! I'm so happy I didn't waste my money on something I can easily make. Here's my problem though: I am 3/4 of the way done and realized that I didn't waterproof the pieces at all. Is there any way I can do that now? Does the puzzle glue or modge podge work well? I was wondering if you would mind giving sharing some tips on how to attach a good zipper...thanks! 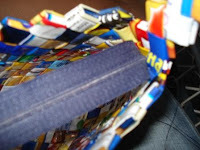 Thanks to your wonderful instructions and the suggestions made by other on this blog, I have began make my own purse from the Sunday Comics using packing tape. I secured the tape with the sticky side up to one end of my table, pulled it the length of my table, layed my cut papers on top and then cut them apart. I cut my "needle" out of the top of a plastic coffee can lid, and used dental floss to sew the rounds together. When I tie a new piece of floss on, I tie a few knots with long tails, pull them tight, tie again, pull and again if necessary until it stops slipping and is tight. I sewed the botton together after two rounds. First, because I wanted to make sure I could make it work before I put lots of work into the project. Second, I though I would have more working room as I sewed. Once I got the hang of it, it was not so hard. With the dental floss, I was able to pull it together without breaking the thread or tearing my folds. I am concerned about putting the zipper in. If I can't get it to work, I will try something else. Maybe a flap? What I have do so far is so darn cute. I just waiting for the Sunday Comics to finish it. 1) Do you know how to do a flat bottom for the purse? 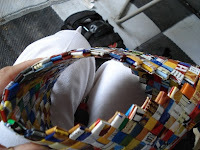 i actulay had some problems in the end about connectiong the chains together by sewing them, on the purse. i noticed my were weak and there were gaps. i really dont know how you do it because i see like the strings and there loose i just dont know how to prevent that. Hi! Mylinda I´m almost done with my purse, and now I have many candy wrappers to make one only with them. I´m afraid to put on the zipper !!! but I´ll try. I already bought the modpodge. Congratulations for your new page. Mylinda... I tried to send a comment that was detailed but had to go and sign up for google and lost it... basically I will make some small purses for the ladies in my family for Christmas and if they turn out nicely I'm thinking about making some to sell at the church to raise money for the purchase of a neighboring lot. Do I need your permission for that. I don't think that I will be using your pattern specifically but your photos of how to sew the pieces together and to add the zipper are the best I've found. This is very good idea. I was a teacher and I tough my students to make something like this. I love recycle handmade. I have just recently seen a couple of these purses being carried by other people and immediately recognized them as candy wrappers. 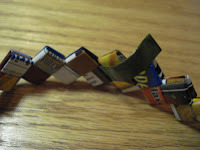 I used to make chains like this from chewing gum wrappers when I was a kid. I had many 10's of feet of chains but never knew what to do with them. Oh how I wish I still had them! 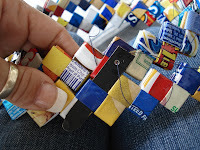 I am very excited to see your blog and the instructions, AND to find out that the rows are SEWN together. I never could figure out a way to weave the chains together. I just wish I had found this in the fall in time to do a few for Christmas. Oh well, there's always next year! THANK YOU!! Your handbags are beautiful! Hey. That's amazing, and really beautiful. I've always wanted to make one! How long does it take to make a bag about the size of the first picture? I'm hoping to send it to some nieces by summer. Could I use my plastic school id for this?? does anyone have any ideas of how to make my rows sturdier so wrappers don't unfold? 1. Do you have to make a needle like mine? NO, You can use a paperclip if you want. One person said they used the plastic from a coffee can lid or maybe pringles lid would work also. 2. Can you use regular sewing cotton thread? If you pull the thread as hard as you can and it breaks, don't use it! If the thread won't break, that's the thread to use. Doesn't matter what kind of thread it is as long as it won't break because I tug mine really hard when sewing the purse together. 3. How do you make rows sturdier so wrappers don't unfold? Sorry to say but if your wrappers are unfolding then your doing something wrong. I've broken wrappers by pulling to hard on my thread but there is no way they can unfold then your sewing the rows together. 4. How long does it take to make a purse? For the little coin purses, my guess is 8 - 12 hours. For the purse, my guess is 40 plus hours. Remember.....this is a pure guess. For the square bottom purse, to many to every want to make two of them, lol. 5. Do you need permission to sell the purses you make? Heck NO, you sell as many as your fingers will allow you to make. Please don't copy, sell or reprint the instructions. 6. My rows have gaps and are week as per one writer. I hate to say it again but then your doing something wrong or pull your string tighter so you don't ever see the string!! Anyone ever make a purse like the ones on http://www.ecoist.com/ Particularly the "Skinny" or the "PacMan". What size do you think the chain links are? They seem to be quite large. I like that look. How do they make it vertical(?) And in the case of the PacMan, how are the sides and bottom made? How do you make an item that gradually slopes out (like a bowl) or in (like a vase)? How do I match up the links if the chains are different lengths? I'm having trouble with wrappers and labels of different weights and quality of plastic. 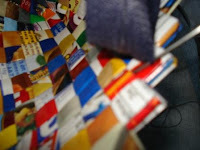 The wrappers from soda bottles are my favorite because they have such bright colors, but they tear easily, and the tight stitching crumples them. When I use tape to reinforce them, they are thicker than some of the other labels and don't lay evenly. I've been experimenting with types of paper to bulk up a thin label. Tracing and tissue paper were too slippery, and regular copier paper was too thick. I'm trying origami paper now, although there is a lot of waste since it only comes in small squares. I bought a roll of self-adhesive laminate at an art store and it works very well instead of the tape (for some reason I'm just hopeless with tape dispensers). I am having a blast with this. My first effort is a mish-mosh of colors, but I'm going to try more sober designs next and use dull laminate for a matte finish. To answer your question on how to make your purse slope up. Each row that you add has such a gradual increase that when your adding rows it's not really noticeable until your completely finished. Just keep pulling the thread tight when you add rows to prevent gapping. I also agree with you about the wrapper from soda bottles being thin but I also love to use them. 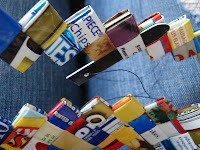 That is when you must add a piece of newspaper or magazine page to the inside of the piece before you fold. If you have a few pieces in your rows of different weighted paper, you won't be able to find them when your completely finished with your project. 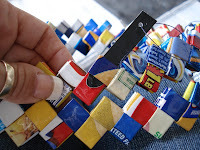 I have torn a few of my chain links when I sewed some projects together and had to go in a fix one link piece....what a nightmare but I went about it like I was joining a row together. It just takes A LOT of patience. Best of luck to you and all your projects. I put the instructions for making a straight edge on your purse on my web page. You're welcome to transfer the info to the blog. Thanks again for the tutorial. Your instructions are easy to follow and a great idea. Thank you! for working so hard to figure these out, and then sharing with everyone. I eagerly await instructions for the flat-bottom bag. I feel a little sad when people post about covering paper in tape or buying plastic banners to make the purses. 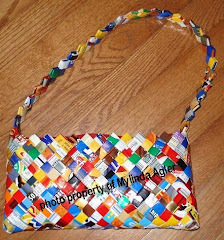 The purses are cool for many reasons, including that find a use for something that's otherwise garbage. Buying packing tape, which I'm sure is made with many weird chemicals, seems contrary to the project's green sensibilities. I think if we put out to our friends/communities that we are looking for chip/candy bags we'll get more than we need. I have also found many lying by the side of the road. Thanks so much! 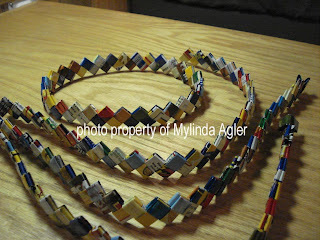 The closest thing I can do to making these are Starburst wrapper chains. I've been wanting to step that up, and make purses. It looks fun, and time consuming, which I think is a good thing, so I have something to do in my spare time. I agree with the latest post, I want to be green, recycle, and make awesome stuff. Thanks again, Mylinda!! Thank you very much for the tutorial! I made an handbag out from a Disney's comics with transparente tape to make it waterproof. I made this kind of work when I was young at school by the noons in Egypt and it was great to create something using the same technique. I sent you a photo by mail. I was so glad to find the steps to making this purse! I first saw one in a cute, little botique, and I've been dying to make one ever since. I'm hoping that I'll get good enough to make some for my family and friends! Thanks so much! I make one purse and geez did it take a long time just to fold the paper. I been searching online and can not find a demensions to make my rectangle bigger so my square will show more of a picture. Can someone help me please? 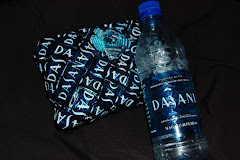 I was just curious what material was used for that silver looking bag on the side of the webpage, right now I'm making a white and blue wristlet thing using computer and packing tape and some clear blue plastic stuff I had, I love it! I can wait to finish!!!! Great blog!!! Anyone have any info on how to make the handles like the ones on this bag?? I've done everything else, but I cant figure out how to make these handles!? Every time i fold these up using ur dimensions i end up with a square not a rectangle. So what am i doing wrong?? Heidi, I know you say you are using the correct dimensions so I don't have a clue what you are doing wrong. My guess is, the first fold is not the long edge or long side. When you make the first fold in half, fold it the long way, not the short way. If you still have trouble send me an e-mail and send you more pictures. and have you seen the candy wrapper chair!! This is fantastic, thanks! My problem is sewing the rows. Finally, I understood the positive/negative, good! It seems, however, that I manage a couple of up/down stitches, I think I'm on my way, but then the direction of the folds changes. I can't continue the easy up/down sewing because the folds are "suddenly" reversed. Does this make sense, and has this happened to anybody else? I tried to make a purse but I'm just wondering why my chains are really losse and like if you pull it not so hard the ends start slipping out and it's not as strong as it looks in the picture. thanks any advice? I can't continue the easy up/down sewing because the folds are "suddenly" reversed. Does this make sense, and has this happened to anybody else? 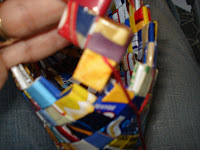 Hi, I'm in the process of making my first candy wrapper purse (or bag, I should say)! Your blog was very helpful Mylinda, thank you! I have already made most of the body of the purse, and I am quite ready to be done with it finally. Anyway, I was wondering if Mylinda or anyone else has ever lined the inside of their purse? 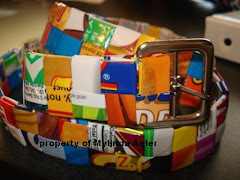 I have not duct taped any of my pieces, since I have been using granola, chip, and other mostly waterproof wrappers. I wanted to make this bag suitable to carry a spiral bound school notebook, so for extra dryness precaution I was thinking of using umbrella fabric to line the inside of the bag... as well as make the bottom and handles! My family has helped me think up of a few possible techniques to achieve this without the umbrella fabric looking like a misshapen lump sticking out the end of the candy wrapper body, but we're not experienced crafters so I was wondering if anyone else had an idea? Thank you for posting this! I crochet bags but this looks like a lot of fun to try for a change. My boyfriend says the guys in prison pay people for their chip bag and candy wrappers. They make things like this and also little cars where the doors open and other things and get a couple hundred for their art work! wow. Who would have thought. lol I can't wait to try this. My dad is a fallen firefighter and we get the Fireman's Grapevine - the LAFD magazine. I can't bear to throw away any of the magazines, but now I can put them to a great use! I think they would make beautiful bags and clutches! Thank you again! Help!!! 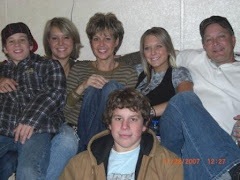 I cannot figure out how to join the circle, when I try to follow the picture instructions, it just confuses me as it seems like something was changed when the views were changed. anyone know what i'm talking about? or can explain how to join my circle. (the first time i tried it, it worked - beginner's luck) but now i really don't know where i'm going wrong. Learn to make this belt following my new instructions. Click on the picture to go directly to the instruction page. I've started a blog with the instructions. Click on the picture to take you directly to the page. 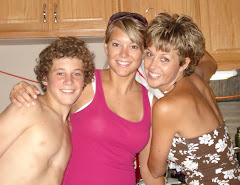 Photos and all contents on this site are copyrighted by Mylinda Agler. I’m offering these instructions free but that doesn’t mean you can do whatever you want with them. Feel free to tell people about my page and share with others. However, make sure people know that it’s my original work. And don’t use it to make money. If you do want to use my page, let me know. Preferably ask, not tell. Nan's Purse - She made it one row taller and the handle longer. 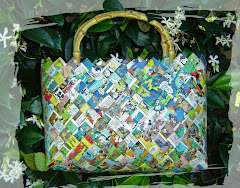 Nan made this purse from magazine covers just for the practice until she saves enough chip wrappers. Made by Annalena from Italy using Dysney's comics. 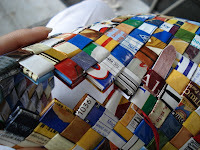 Wine Bottle Holder made by Katie out of magazine pages covered with tape. Visit her page by clicking on the picture. 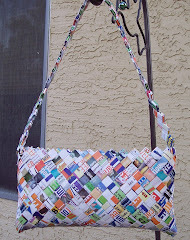 Yvonne Parkhill made this purse using newspaper and following my instructions. If you found these instructions useful, please consider making a donation. By default, a blog is protected by your own copyright, please do not use any of the material that I've provided without my explicit permission.